Faulty fire lines created at a cost of Rs 1.4 crore by skirting transparency rules, lack of supervision and a general slackness towards fire prevention led to the loss of about 4,850 hectares (12,000 acres) of forest area of the Bandipur Tiger Reserve in February. These are the findings of a high-level committee that conducted an in-depth inquiry into the unprecedented forest fire incident last month. Sources in the Forest Department, requesting anonymity, revealed to DH that a team of officials that conducted the inquiry found that the fire lines, which should be at least 10 metres in width, were three to five metres at several stretches. While the records showed that about 2,500 km of fire line was built, officials found they were absent at several places. “These are glaring errors and violation of rules. This has been brought to the notice of the seniors in the department. A report will also be submitted to the government in this regard,” the source familiar with the development said. A forest official in Mysuru said the visiting officers raised a red flag over the execution of fire line work without calling tenders. “About Rs 1.4 crore was spent for creating a fire line. However, the works were awarded in piecemeal though there was no exemption from the Karnataka Transparency in Public Procurement Act. A good fire line could have limited the blaze to a small pocket,” the official said. The inquiry report, already submitted to the Principal Chief Conservator of Forests (Head of the Forest Force), said that there was a general slackness among officials ranging from the field director to the range forest officers (RFO). 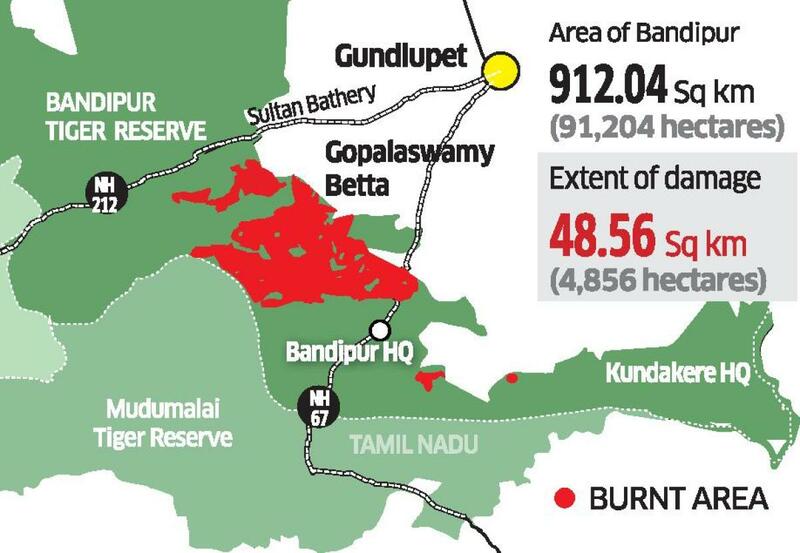 During the inquiry, officials were surprised to find that fire management formed only two pages of the 500-page Work Plan for the Bandipur Reserve. “The work plan sets out the guidelines and details of the works to be taken up to protect the forest area. But fire management, which requires 40% of time and energy of officials, was given only two pages with barely any details,” the source explained. When DH contacted PCCF Punati Sridhar, the officer refused to comment. However, a member of an NGO who worked in Bandipur said that a previous report had in fact warned about the prevailing issues in the area two years ago. “It’s an open secret. After the major fire in 2016-17, a report had highlighted the lack of preparedness — the officers were unable to start a water pump and the machinery was broken. Orders did come from the top to conduct drills on a regular basis to train workers. All of that has fallen on deaf ears,” the volunteer told DH on condition of anonymity. The Forest Department is mulling a month-long ban on safari in tiger reserves between mid-February and March. Some of the major fires have occurred in these months. An official said the ban was a way to channel all resources — vehicles, drivers etc — into fire prevention works.